The flexible rotor modeling has an advantage over rigid rotor modeling, by its suitability to model rotors of complex shapes with multiple discs and bearings. 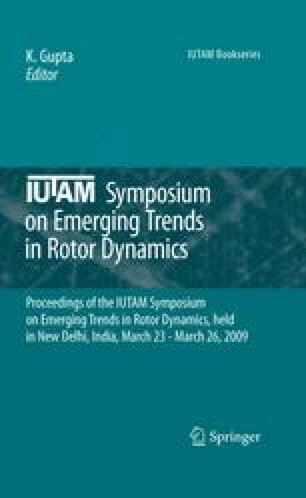 In this paper, the non-linear dynamic behavior of a horizontal unbalanced flexible rotor supported on deep groove ball bearings is theoretically studied in detail for instability and chaos. A generalized Timoshenko beam FE formulation, which can be used for both flexible and rigid rotor systems with equal effectiveness, is developed. The shape functions are derived from the exact solutions of governing differential equations. The formulation is validated for mass, stiffness and, gyroscopic matrices and for nonlinear dynamic response. The steady state quasi-periodic solution is obtained by the non-autonomous shooting method, which also gives the monodromy matrix. The eigenvalues of monodromy matrix give information about stability and nature of bifurcation. The maximum value of Lyapunov exponent is used to decide upon the chaotic nature of the dynamic response. Different sets of clearance values, unbalance excitation force, and shaft flexibility are investigated for the presence of instability and chaos. Finally the range of parameters is established for the same.